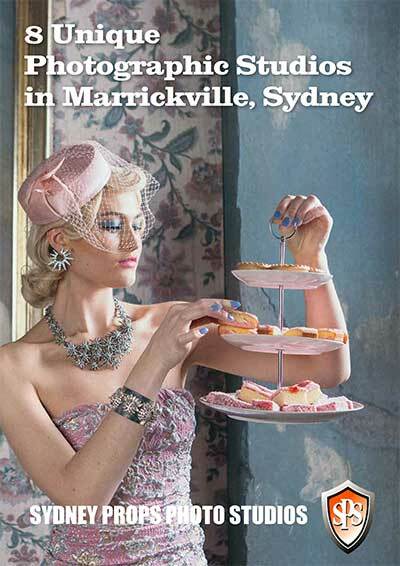 Sydney Props Photo Studios has 8 unique photographic studios located in Marrickille, Sydney. Each studio has its own distinctive character imbued with texture, quality of light and stand-out features. 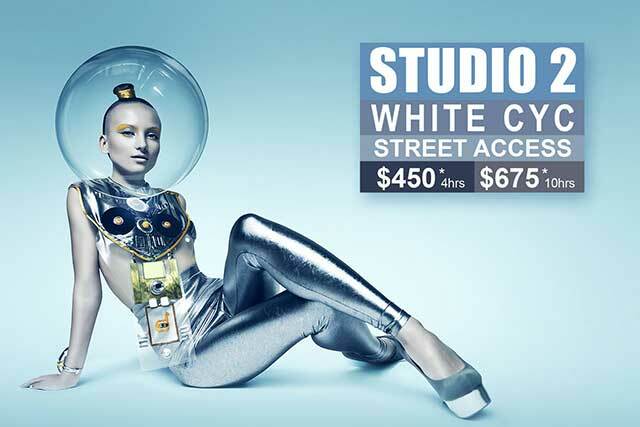 Studio 2 has one of the largest white cycloramas in Sydney, Studios 4 and 5 are soundproof, studios 7 and 8 have ready to shoot sets. All of our studio hires gain access to one of the largest collections of props in Australia at 50% off the usual rate. Access to props as well as the production services of the team at Sydney Prop Specialists gives your production the edge – from detailed styling to spontaneous creativity. Studio 1 Warehouse is our largest photographic studio – situated on the top floor of Sydney Prop Specialists, it offers a floor area of nearly 300m² and a ceiling height of 4.5m. Light and airy with loads of character, this 100 year old warehouse space, with its exposed roof rafters, rough distressed timber walls, original unpolished timber floorboards, corrugated cladding and original sash windows, offers great texture and a variety of usable natural lighting conditions – and has room to move, or build a set. Studio 2 White Cyc has street access and a large loading dock equipped with a wide 4.5m high electric roller door – access for large sets or vehicles is made easy. The space is 4.2m high to the rafters and 8m wide by 9m deep featuring a white infinity cyclorama. The studio has a huge adjacent client vestibule with leather lounges and a staging area within the studio that is 8m x 4m. A coffee machine is provided as well as a commercial fridge that will accommodate large food platters. The walls of the studio makeup room are clad with old corrugated iron, providing a second surface to shoot against. 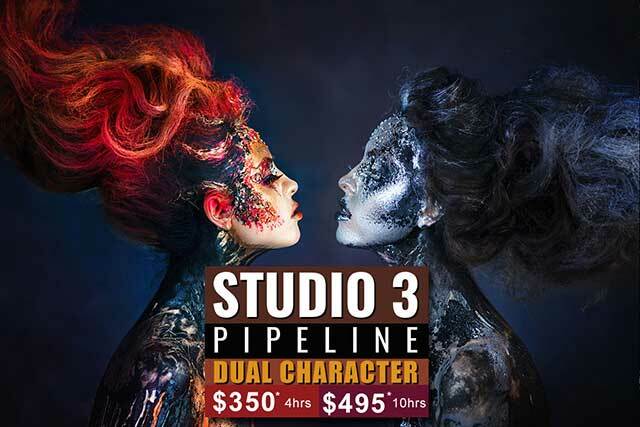 Studio 3 Pipeline is a creative photographic space with dual character. With a floor area of 6m x 5m is the smallest of our studios but it is also one of our most versatile. The studio offers a solid white wave-form infinity cyclorama 3.5m high – while directly opposite the cyc. the studio entrance is set-finished as a rustic interior with old timber walls, wooden floor, corrugated iron cladding and a sash window – with the studio doors closed it forms a perfect set to shoot in or use as a background. 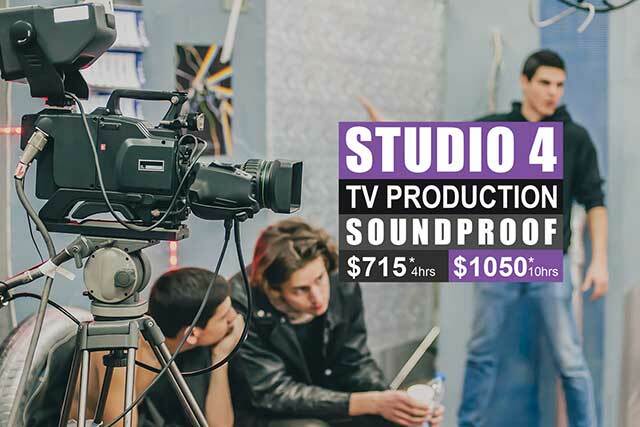 Soundproof and air-conditioned – Studio 4 TV Production offers many production advantages for directors looking for a space with clean lines that they can customise. The space is 9m wide by 12m deep, with a ceiling that steps up from 4.2m to 5.9m affording additional shoot-off latitude for low angle shots. A motorised truss extends the full width of the studio’s high end. The lower section of ceiling has four rows of lighting bars and additional cross bars can be installed to provide a lighting grid over the entire space. 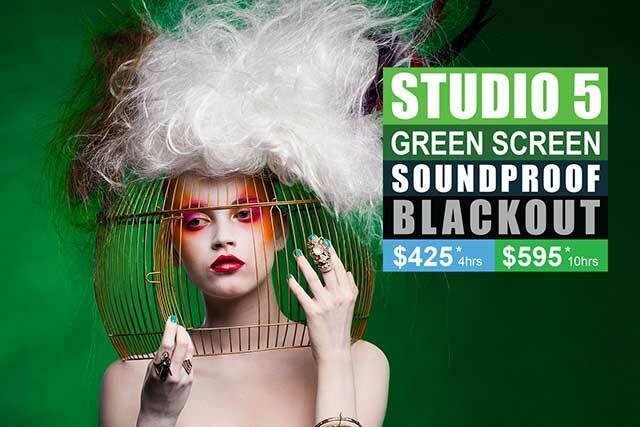 An air-conditioned, soundproof studio with green screen that can be totally BLACKED OUT. The space is 4.8m by 9.2m with a ceiling height of 3.5m. Makeup and change room facilities are also provided and easy access to a loading dock. Our Green Screen Studio is pre-lit, ready to shoot. Included in your booking are 3 LED soft panels mounted in the roof. Each are bi-colour and wirelessly remote controlled, allowing colour temperature adjustment from 2000k to 8000k and dim to your requirements. We also supply one 6 bank and 2 bank fluorescent lights on stands to evenly light your subject. 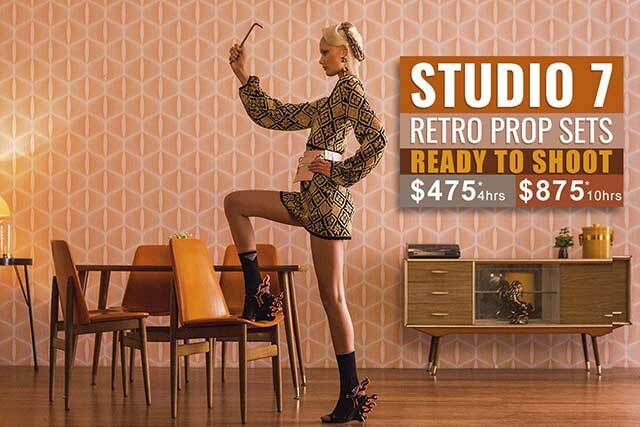 Studio 7 Retro Prop Sets is designed to minimise setup time for your shoot. At over 250m² there are many sets ready for you to walk in and get to work. Period Sets include: 1920s grandma lounge room, 1950s diner, 1960s dining room, 1970s lounge and bar setting, white french ballroom with crystal chandelier, 1940s wash room and 10 x preset mottled backdrops on a curtain track system which makes it ready for fast change. There are also other wallpaper and textures available in this space plus access to the Textural Studio when available. 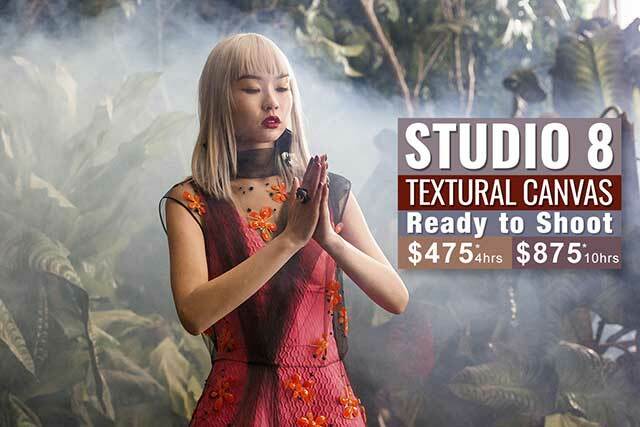 Studio 8 Textural Canvas contains a unique set of backgrounds and quirky set vignettes specifically designed for fashion photography in a space of over 350m². Themed Sets include: lush jungle set, old manor house (haunted house look), old world gym set, modern bedroom set that can also be adapted for use as another sort of interior room, mini distillery set, Arabian set, school classroom set and much more. Plus there is access to Studio 7 Retro Prop Sets when available. 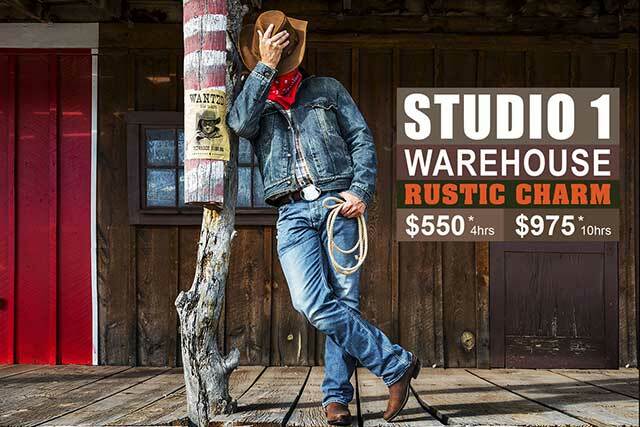 Rustic Warehouse Photographic Studio, Soundproof Studios, White Cyc Studios, Green Screen Studio, Video and TVC Production Studios, Ready to Shoot Sets – Lighting Hire Available and Access to Props. Rigging, set design, construction, set dressing and custom prop making, signage and graphic design, greens department, scenic art and carpentry.